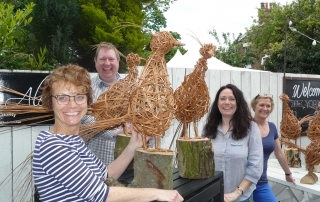 A super day making willow pheasants with a wonderful bunch of people at Yorkshire Ales, Snaith. Lots of fun and laughter and amazing pheasants! Well done. Check out my other workshops on the Workshops and Events Page. I met lots of lovely people on Saturday 13th May at Drewton's. 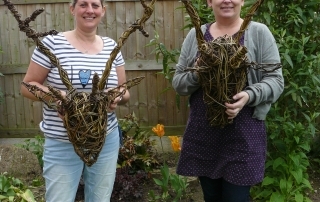 Seven bookings and only 3 places left for Saturday 17th June Willow Hare Workshop and Afternoon Tea. Today I'm busy making examples of my willow work ready for my new workshops. Take a look at my 'Workshops and Events' Page to find out more. 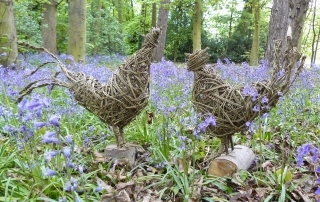 I will be heading to Drewton's on Saturday 13th May (11 - 3.00) to showcase my willow work. Come and meet me for a chat to find out more about my forthcoming Willow Hare Workshop at Drewton's on Saturday 17th June. Had lots of fun today with these lovely ladies making their Stag Heads. They look fabulous.